ConnectWise Manage offers a robust project management module that connects all crucial business processes in a single application. It increases accountability among your members across various teams and departments and provides one source of truth for your business. ConnectWise Manage can help you streamline operations and processes, allowing you to efficiently maximize your resources with ConnectWise Manage’s error-proof ticketing, clear lines of communication, and robust documentation. Its reporting features and dashboard allow you to understand your business better, empowering you with accurate strategic business decisions. When it is time to bill your clients, all notes, time entries, expenses, and products from your departments make their way to your Finance team, enabling them to generate detailed invoices and disseminate them quickly with little information lost. The competitive edge of ConnectWise Manage is the unique combination of project management, customer service, sales, management, and billing capabilities, thanks to which this suite eliminates the need to use several systems simultaneously. Designed to ease to a large variety of activities, ConnectWise collects and stores all your data, and gives you full visibility on the progress of your operations. With ConnectWise Manage, you will be able to assign and manage projects, follow supply and purchase orders, control sales, develop marketing strategies, and serve customers all at once. The system is also designed around an advanced communication technology, which makes it suitable for large and decentralized teams looking to collaborate on common tasks. With a single system to take care of your operations, you will be saving both time and money. With ConnectWise Manage in charge of your processes and operations, you will have enough time to devote to the main moving force of your business – your customers. The system ensures clean lines of communication, fast and efficient help desk with superior ticketing, and most of all – accurate documenting of all activities. This way, you can deliver more successful workflows, and capture and track every step of your agents’ activities. The vendor will also provide a free guide on developing intelligent service strategies. ConnectWise Manage will not only help run a successful business, but also provide full visibility into the health and progress of your operations. You can use its numerous, powerful reports to make data-driven and informed decisions, and get a centralized view on all different aspects of your business. Another of ConnectWise Manage’s unique features is financial control, as the system funnels all of your transactions, tracks time, and handles your billing and invoicing activities. This way, the system helps you avoid manual errors, and offer professional and in-time service while collecting payments in time. Each company has different wants and needs an application that can be personalized for their size, type of employees and clients, and the specific industry they are in. For these reasons, no system can proffer perfect features off-the-shelf. When you look for a software product, first be sure what you want it for. 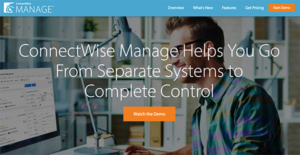 Read some ConnectWise Manage reviews and ask yourself do you desire basic functionality or do you require complex tools? Are there any industry-specific features that you are searching for? Get the answers to these queries to assist your search. There are multiple factors that you need to reflect on and these include your budget, specific business wants, your company size, integration requirements etc. Take your time, check out a few free trials, and finally select the app that presents all that you want to enhance your company efficiency and productivity. How Much Does ConnectWise Manage Cost? Enterprise pricing of ConnectWise Manage is only available upon request for a personalized quote as they customize plans according to each business’ unique needs and scale. We realize that when you make a decision to buy Project Management Software it’s important not only to see how experts evaluate it in their reviews, but also to find out if the real people and companies that buy it are actually satisfied with the product. That’s why we’ve created our behavior-based Customer Satisfaction Algorithm™ that gathers customer reviews, comments and ConnectWise Manage reviews across a wide range of social media sites. The data is then presented in an easy to digest form showing how many people had positive and negative experience with ConnectWise Manage. With that information at hand you should be equipped to make an informed buying decision that you won’t regret. Thanks to this tool, our IT has never been this successful! A ticketing system that works well. Things wouldn't go the right way if it weren't for ConnectWise. A finely tuned ticketing platform. Managing my business and tickets has never been this simple. What are ConnectWise Manage pricing details? What integrations are available for ConnectWise Manage? Pros: One of the best things with this software is flexibility. There are plenty of modules for just about anything you need. It's even capable of building and running reports based on what you've contained in the platform. Making list views to look into things the way you want them to is super easy. Cons: The UI doesn't seem to be the most intuitive. Menus are usually embedded within menus. Since the software is powerful, there have been instances where I struggled to find what I really needed. For instance, I had a difficult time seeking a place to add in subcategories and categories. Pros: I love their service. Great service ticket management system! Manage enabled us to set priorities on incoming request. It triages from the most important ones to the least. When it comes project tickets, it gave me the ability to look into anything and schedule things in an efficient manner. Cons: It seems the permissions trees have grown a little wild since the last set of updates that included new features. We're noticing how specific job roles are incapable of doing things. We had to isolate the changes ourselves and do fixes on the permissions. An intricate and robust helpdesk solution. A great option to have. A ticketing system that works really well. A solid tool worth using. An awesome ticketing system that every business in the world should have! If you need more information about ConnectWise Manage or you simply have a question let us know what you need and we’ll forward your request directly to the vendor.